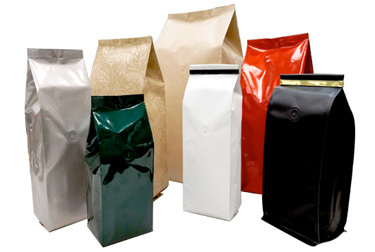 Traditionally used for coffee and tea, these side-gusseted bags are now growing in popularity in the food, snack and baked good industries. The side-gusset feature allows your package to be displayed vertically or horizontally, giving retailers more options for shelf display. With sizes ranging from 2 oz. to 5 lbs., finding the right size bag has never been easier. These bags are available in many vibrant colors including our popular Aroma Pattern. Coffee Packaging - These gusseted pouches are great for keeping fresh roasted coffee (beans and ground) roaster fresh when the pouch is opened. Because coffee will let off CO2 gas for up to a week after roasting, most of our gusseted bags are available with a small one-way degassing valve which will allow the CO2 gases out but keep outside air from going in! These valve will keep your coffee in the tight "brick like" packages that comes out of your vacuum pack machine.